Last Thursday evening May 31st, six young Formosan Blue Magpies (Urocissa caerulea), the recently designated "national bird", were taken from their nest across the street from Wan-Xing Elementary School on Section 2 of Hsiu-Ming Road near National Political University in the Taipei suburb of Mucha. In May, the Blue Magpie was chosen as Taiwan's National Bird by a nationwide poll, far outpacing the other species as a beloved symbol of this nation. As a protected species listed under the Wildlife Protection Act, it is illegal to disturb a nest, possess, raise, buy, or sell the birds. When contacted on Thursday, the Conservation Division of the jian-she-ju of Taipei City government, the agency responsible for enforcing the Wildlife Protection Act within the city limits, promised to investigate. They actively investigate and prosecute violators of the Wildlife Protection Act. Local residents and schoolchildren were excited about the presence of the nest, and regularly spotted the parents searching for food in the schoolyard and surroundings. Teachers at Wan-Xing Elementary School, taking advantage of this excellent teaching opportunity, had prepared information on the birds and passed it out to the student body. Ms. Lai at the school said that this is the first year the birds have nested in this immediate area. One neighbor speculated that the construction and operation of the new cable cars between Taipei City Zoo and the Maokong tea drinking area may have altered the bird's habitat, causing them to build their nests closer to the city. Taiwan's unique wildlife heritage should be protected and enjoyed by all. 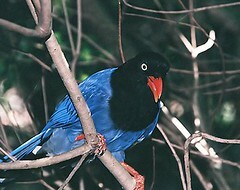 The Formosan Blue Magpie is a wild bird. As with all wild animals, it should be left alone, and allowed to grow, feed, and prosper unmolested by humans. The Taipei Wild Bird Society has received several reports of nests of this species being robbed in the past few weeks, from Neihu, Taichung, and other areas, which is an ongoing problem. It is ironic that only when the Blue Magpie became a symbol for Taiwan that its popularity has brought it harm. Daniel P. Chamberlin is a science and medical editor and life-long conservationist based in Taipei.